I took one look at the track-listing of this 3-CD set and thought to myself, as anyone would in such trying circumstances, what on earth is going on? Then I read the rubric of the set and found things more explicable if not, perhaps, more digestible in terms of programming. To explain: the impetus came from ‘Invitation to Composers’, an international composition project (I’m pretty much quoting) that lasted from 2009 to 2011 and was inaugurated by the London Schubert Players. Composers were asked ‘to write for specific instrumental combinations that were missing or seldom encountered in the chamber music repertoire’. The models included the three works in disc one: Mendelssohn’s Concerto for violin, piano and strings, Saint-Saëns’s Septet and Enescu’s Chamber Symphony, Op.3 and the works that aren’t recorded: Messiaen’s Quartet for the End of Time and Schubert’s Trout Quintet. A bit of a strange bunch, really, which is perhaps the point. In addition, the Romanian Musical Adventure, an organisation formed to promote and record works by native composers, as well as new and lesser known works - not necessarily Romanian - has also been involved, which explains the high number of pieces by Romanian composers and the contribution of a large contingent of Romanian instrumentalists. Thus, to recap, some of the models are established in one third of the set and the remainder is given over to the varied works that they spawned. I appreciate and admire the energy of the blurb writer in proclaiming that ‘their varied aesthetics and subtle craftsmanship’ represent a ‘vibrant continuation of our great chamber music heritage’. Does this large claim hold up? Avoiding the standard answer of ‘yes and no’, I’m inclined to say that, whether they do, or not, I’m very glad to have made their acquaintance. I was seldom bored and often entertained, and was frequently admiring of whatever aesthetics were being advanced. Given the nature of the invitation to the composers, I’m inclined to pass swiftly over the first disc, though the models it presents are deftly and characterfully played. There is a freshness to the performances that appeals, even in the case of Enescu’s last completed work whose luscious languor is brought out well. The booklet goes into extensive detail about the composers and their works and rightly assigns the model selected by them — whether Mendelssohn, Saint-Saëns, Enescu, Schubert or Messiaen—though obviously there’s little or no stylistic consonance between model and successor work. Each composer brings something of interest. Sviatlana Rynkova’s Three Allegories are witty miniatures, whilst Jonathan Östlund is represented by two of his Three Poems which offer contrasting pleasures in terms of texture and rhythmic impetus. Richly scored and sonorous, Drew Wilson’s Nocturne with Cloudscape traces a busy narrative, John Reeman’s Tableau (model: Messiaen) is terse and voluble alternately, and Bjørn Bolstad Skjelbred’s Echoes of Times Lost is subtly coloured, cleaving close to Enescu and Bartók. Perhaps the most engaging of the pieces in this disc is Ana-Maria Avram’s Ten Romanian Songs from Béla Bartók’s folk music collection which she’s scored for viola, piano and string quartet. The viola lends a richer hue than a solo violin and the cimbalom imitations are spot-on, so too the percussive pizzicati. These engaging and exciting pieces are, as with everything, extremely well performed. Yuri Zhislin plays the solo viola. The third disc opens with the rather filmic Marittimo from Ivan Božicevic which also sports a rather jazz influenced muted trumpet, and some powerful domineering open trumpet (Huw Morgan — excellent) in the finale. Marcus Blunt’s Two Serenades are well contrasted. Meanwhile Rodney Waschka II takes Saint-Saëns as a model but cunningly appropriates some Falla (Harpsichord Concerto). Eberhard Eyser is the senior composer, born in 1932, and his craftsmanship can be enjoyed in The Nightingale was Singing All Night Long, a thoughtful work suffused with Berg. Uberto Pieroni adds some more filmic warmth before Adina Dumitrescu contributes a sliver of abrasion in J’ai trouvé les Histoires though it does have its more quiet moments too. Salvador Torre is represented by just one section (Gershwin Tornado — which lasts only 1:40) from his Clouds. It doesn’t really make sense, in the context.Finally there’s some Bali-influenced music with percussive sonorities from Lucian Zbarcea. This is, necessarily, a very specialised acquisition. The aim to expand the repertoire, and perhaps produce contemporary works that can sit alongside the older models, is laudable; that said, a couple of the models are hardly ever played. Still, despite the odd looking package, as I noted earlier, I’m glad I listened. There are some exciting sonic adventures here, if you care to listen out for them. 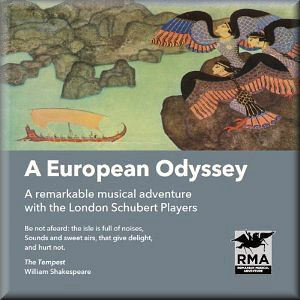 Kate Smith has kindly forwarded me the favourable review you are hosting for our European Odyssey CD set. We are delighted that Mr Woolf enjoyed it and said laudable things about it. 3. RMA didn't have any role in choosing the performers and there were only nine Romanian performers beside myself and some 60 British and international performers in the EU project. Because of Romania being one of the official European partners in the project, we had the obligation of inviting an appropriate number of 'native' musicians to perform with us. 4. Clouds is a very interesting 20-minute long work which was not chosen for inclusion in the set mainly because it was considered to be more contemporary advanced and as such, more difficult to-listen-to. However, this work, together with several others which were not chosen for the Nimbus set - also because of certain noises in the live performances - are available from the project's website www.invitationtocomposers.co.uk and through downloads from Nimbus Alliance. We would be very glad to send CD copies to Mr Woolf should he wish to review these as well. 5. Or own concert programming experience revealed how difficult it was to programme the models because of the lack of worthy works with the same instrumentation in the standard repertoire; our aim was to create more of these works for the repertoire in order to encourage the performance of the models as well. 6. Additional information omitted from the booklet: the illustration on the cover is by Edmund Du Lac and represents Ulysses on his boat and the Syrens on the rocks.